I’m a sucker for movies that rattle my heart. There are few things in life that can tell a story well. My preference is reading about something but I will not resist an incredible movie. Tonight I watched “The Express”. On the surface it was a story about great resourcing from an American College Football perspective. Picking the best players at the right time for the right college. But obviously the glaring message of the movie was more about African American trailblazers and pioneers. Watching the movie, amongst other things (like balling my eyes out when Ernie Davis won the Heisman Memorial Trophy- a first for an African American) actually got me thinking about how exciting it is (and allow me to be political here) that by virtue of you being born black in this generation, you have the ability to be a pioneer at almost anything. There are very many things that our parents, grandparents and forefathers did for us to be the ones who cross the finish line- if we choose to. However many of the things we achieve, we don’t tie back to our histories in a way that sets our future generations up for success. It’s all about, “me” and “now” and then we’re gone, having lived the most selfish, entitles and uninspiring lives. On a more democratic note, the message of this movie really touched me. Our generation is so geared up for instant gratification, selfish journeys and making it rain, we lose the simple purpose of our lives. 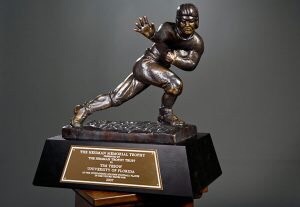 The first time I knew vaguely about the importance and significance of the Heisman trophy in African American history was when I was watched a 10 part documentary of the OJ Simpson trial and he had this trophy in his house, I digress, but the point I’m trying to make here is that, before there was Earnie, there was Jim Brown and without Jim sticking to his purpose and paving the way, breaking the ceiling and consciously reconfiguring the default settings of the future for African Americans in American Football, there would have been no Earnie. How many of us are meant to be Earnies and really shift the dial and make history? The answer is all of us, irrespective of race and creed. We all have a part to play for ourselves and our families and our societies. Our parts have a beginning and an ending, nature let’s us know when it’s game over and oftentime we have no control over the starting and ending of a season. What matters is how we prepare for each season and journey. Wouldn’t it be such a waste to take that for granted? To show up entitled to the win just because you fit x prerequisites? As this new week begins, I begin it with this one thought in mind, we all have a race to run, partly for ourselves and partly for our future, will I be doing justice to my successors paths?